On the campus of my old college, Kansas University, in an old but imposing building, there is a natural history museum. In this quiet place you can visit Comanche, favorite horse of Capt. Myles Keogh of the Seventh Cavalry. Found on the battlefield with numerous wounds, Comanche was the only known survivor of Custer’s column at the Little Big Horn. The last rifle shots this horse heard fired in anger, at least from his side, were on June 25, 1876, from carbines chambered to the .45-70. Amazingly, the .45-70 remains among our most popular centerfire cartridges. “Most popular”? You might question this, but in current sales figures I’ve seen—whether for rifles, ammo,or reloading dies—the .45-70 is right up there. In any recent data, you will usually find, in various order, .223, .22-250, .243, .270, .308, .30-06, .300 Win. Mag., 6.5 Creedmoor, maybe the 7mm-08 and .30-30. But you will also usually see the venerable .45-70. Not long ago I characterized the .45-70 as a short-range cartridge and immediately drew letters from several shooters who enjoy ringing long-range steel with their .45-70s. You bet you can. In 1866 we adopted the .50-70, among the first centerfire cartridges, in the Allin-conversion trapdoor Springfield. In 1873 we switched to the lighter, faster .45-70-405, the latter number denoting a 405-grain bullet. In 1879 we tested a heavier 500-grain bullet and found it to be better at extreme range: The heavier bullet was found effective to 3,350 yards, about 1.75 miles. The .45-70-500 was adopted in the beefed-up 1884 Springfield. Because of brutal recoil in carbines, lighter loads (.45-55) were issued to cavalry. The accuracy standard for the trapdoor Springfield was a four-inch group at 100 yards. This translates to more than 11 feet at 3,350 yards. The intent was for volley-fire against massed troops. Whether this was ever attempted at such range I have no idea, but in the Spanish-American War, when the Army should have had .30-40 Krags and the Navy and Marines should have had the 6mm Lee Navy, a lot of our troops still had trapdoor Springfields. There are marvelous accounts, mostly from the Philippines, of our troops doing effective sniping with .45-70s well beyond 1,000 yards. They didn’t use laser rangefinders, nor did they twist their turrets or use hashmarks in scope reticles. They used ladder sights, and like artillery, they registered fire on distant, unoccupied positions and trail junctions, and when hapless Spaniards appeared they potted them with disconcerting regularity. Whether the loads used were the .45-70-405 or .45-70-500 doesn’t seem to be recorded—it was probably the latter—but it proves Boddington’s Ballistic Law: At some distance, with any cartridge, trajectory is just a number, and if you know the number you can make hits. That said, I hold to my premise that, at least as a hunting cartridge, the .45-70 is a short to, at best, very medium-range cartridge. It was introduced 15 years before the first smokeless powder cartridge—20 years before the first American smokeless cartridge—so I find it fabulous that it’s not just still with us but still popular. Thing is, the grand old .45-70 works. The equation that derives foot-pounds, our most common measure of projectile power, requires the square of velocity, while bullet weight and frontal area are taken as is. Foot-pounds are real and scientific. Alternate theories such as momentum (Keith’s pounds-feet) and Taylor’s “Knock-Out” values are not as rooted in hard science, but I still think we’re missing something. Despite slow velocities and thus modest foot-pound yields, large-caliber bullets hit hard. It’s probably an issue of energy transfer, which has never been properly quantified. Whatever the reason, close-cover whitetail hunters know, as do black bear and wild hog hunters, that the .45-70 anchors game. Although loaded with smokeless powder for a century, standard factory.45-70 loads are mild in case they might be used in trapdoor Springfields. While the trapdoor was a clever post-Civil War expedient, it is not a strong action. These days many of us use light-for-caliber bullets, 250 grains up to 300 grains. They’re a lot faster without increased pressure, flattening the trajectory (at least to medium ranges). With the great bullets we have today, this doesn’t matter on deer and probably doesn’t matter much on black bears and boars. Frontal area does matter, and even with lighter bullets the .45-70 is a thumper. For larger game I’m pretty sure you’re better off to forget about velocity and go back to the 19th-century formula. You still have the hard-hitting frontal area, and bullet weight gives you penetration. In the late 1870s the .45-70 was the most available cartridge on the Great Plains, and I suspect it accounted for a lot more bison than the sexier Sharps cartridges. In Africa and India the .577/.450 Martini Henry, with similar ballistics to the .45-70, was widely used on large game well into the 20th century. 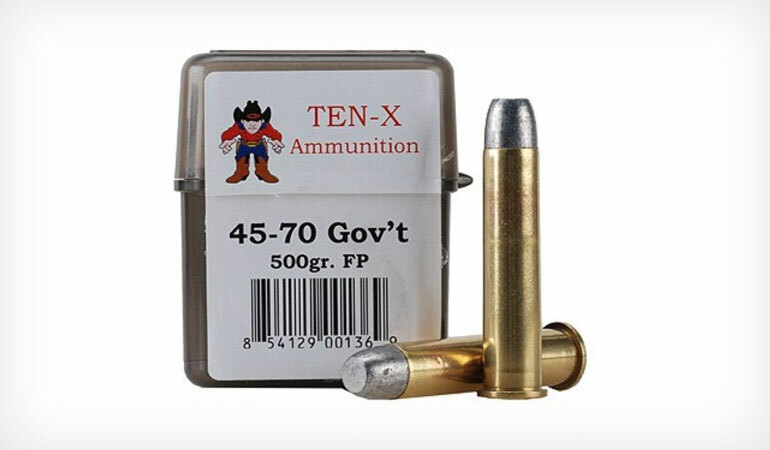 Hard-cast bullets penetrate extremely well at .45-70 velocities. At close range it wouldn’t bother me to tackle a big bear or a Cape buffalo with a standard 405-grain .45-70 load at just below 1,400 fps. The energy yield isn’t impressive, but between frontal area and penetration—coupled with good shot placement—it would do fine. Fortunately, there are stronger actions that can handle more, and you can handload accordingly. Most loading manuals offer “grades” of loading data: trapdoor Springfields, 95 Marlins and 86 Winchesters, and the Ruger No. 1. With the lever actions you can easily get a 400-grain bullet over 1,800 fps, and now we’re talking business. With the Ruger No. 1 and other strong falling blocks, you run out of case capacity before pressure becomes an issue, but you can come close to the .458 Win. Mag. Commercial loads are another option. For decades Garrett has offered ascending levels of .45-70 loads, from trapdoor Springfield to Ruger No. 1. Its super-hard-cast flat-point bullets are great for both impact and penetration. Mind you, I am not a .45-70 freak. I don’t push the range envelope with them, and although I’ve taken lever actions and single-shots to Africa, none have yet been .45-70s. But I admire the cartridge and always have a couple of .45-70 rifles on hand, even though for a long time I thought, incorrectly, it was sort of a specialized cartridge. Until recently, I didn’t realize it was so generally popular. I think that’s marvelous—a ghost from the Old West that’s not only still with us but also still useful.